Why doesn’t a spider’s web sag in the wind or catapult flies back out like a trampoline? The answer, according to new research by an international team of scientists, lies in the physics behind a ‘hybrid’ material produced by spiders for their webs. Pulling on a sticky thread in a garden spider’s orb web and letting it snap back reveals that the thread never sags but always stays taut—even when stretched to many times its original length. This is because any loose thread is immediately spooled inside the tiny droplets of watery glue that coat and surround the core gossamer fibres of the web’s capture spiral. This phenomenon is described* in the journal PNAS by scientists from the University of Oxford, UK and the Université Pierre et Marie Curie, Paris, France. The researchers studied the details of this ‘liquid wire’ technique in spiders’ webs and used it to create composite fibres in the laboratory which, just like the spider’s capture silk, extend like a solid and compress like a liquid. These novel insights may lead to new bio-inspired technology. The novel properties observed and analysed by the scientists rely on a subtle balance between fibre elasticity and droplet surface tension. 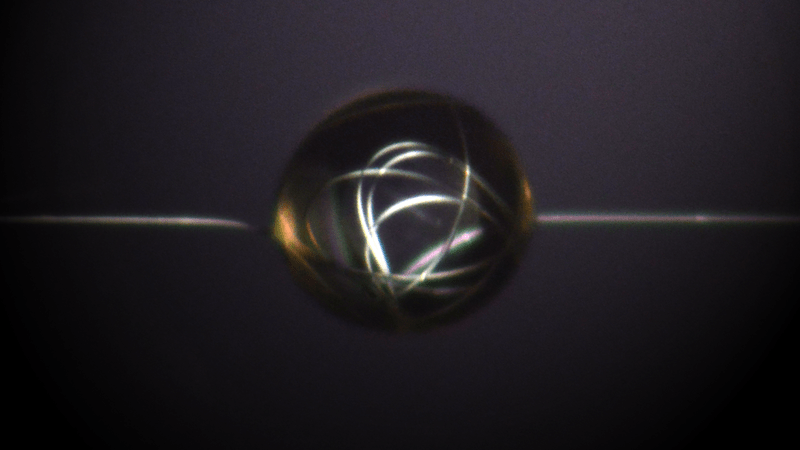 Importantly, the team was also able to recreate this technique in the laboratory using oil droplets on a plastic filament. And this artificial system behaved just like the spider’s natural winch silk, with spools of filament reeling and unreeling inside the oil droplets as the thread extended and contracted. Dr Hervé Elettro, the first author and a doctoral researcher at Institut Jean Le Rond D’Alembert, Université Pierre et Marie Curie, Paris, said: ‘Spider silk has been known to be an extraordinary material for around 40 years, but it continues to amaze us. While the web is simply a high-tech trap from the spider’s point of view, its properties have a huge amount to offer the worlds of materials, engineering and medicine.